I most certinaly was not unable to get out of the car on the ferry because I couldn't open my door wide enough for my big belly to fit through. I did not simulate putting the baby in and out of the crib with a stuffed animal. Not me. I don't do such childish things. The other night I was not going to kiss Devin, when I definatly did not burp and a little throw up came up too. Gotta love that heartburn. Not me! I would never do such a unlady-like thing. And upon running in from the car to use the bathroom, I most certinaly did not clog the toilet. No way. I would never do such a thing! Just a few of the things I did not do and even if I did would definatly not blog about. Arn't you glad we arn't perfect. Another not me! Monday. 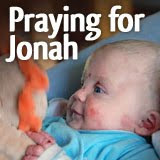 Check out MckMama's blog for her and everyone elses Not Me! Monday's. shedding the lanugo (the downy soft baby hair that has been keep baby warm). Pretty cool huh. It's amazing how our bodies develop. I am more in awe of our wonderful and amazing creator! I am doing great, no complaints here. I do feel kind of weird, just not all the way there, most of the time. I am having issues with low blood sugar and can really tell after I have eaten a high carbohydrate meal or a sugary snack, but what is one to do. I have been feeling other normal pregnancy things like slightly swollen feet, heartburn, aches around my belly, back aches, and tiredness. I have gained 22lbs thus far. I should be gaining about 1lb per week now for about another 10lbs and I really hope not much more than that. Our baby is positioned head down but the head is way to the back. I feel the bum and feet pushing and kicking the top of my belly and getting under my ribs. I love feeling and watching the baby move. 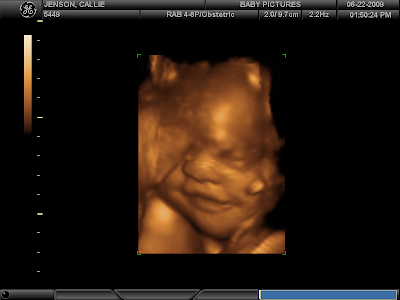 Here are a few more pics from the 3D ultrasound for your viewing pleasure. (Our baby had his/her forehead smushed against my uterus, hence the blob looking forehead). We think our baby looks like Devin. Definitely has Devin's lips. What do you think? 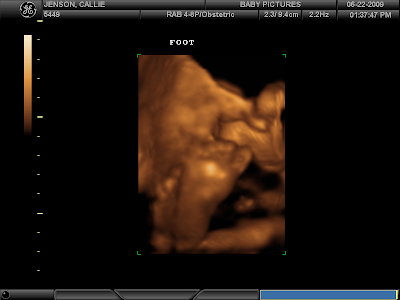 This week our baby is about 17inches long and around 3lbs. Our baby is close to his/her actual birth length (I was 19in), but still needs to gain a lot of weight, though hopefully not too much. 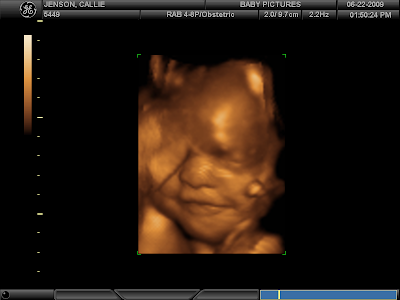 At the last ultrasound our baby was around the 46th percentile for weight. 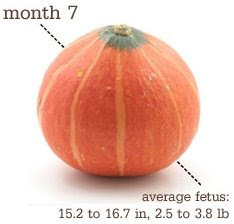 At 40 weeks, the 46th percentile is in the 7lb range. That sounds pretty good to me (much better than 10lbs). I am feeling good for the most part. A lot of times I just don't feel quite right, likely because of my blood sugar, but I am not feeling poorly. I don't feel like I am carrying a lot of weight yet. I am having a lot of stretching pains in my sides and lower abdomen area. Sharp stabbing pains, I guess it's getting me ready for labor, and thank you for epidurals. Our baby is still moving around seemingly all the time. The other morning I definitely felt a little elbow or foot sticking out for the first time. 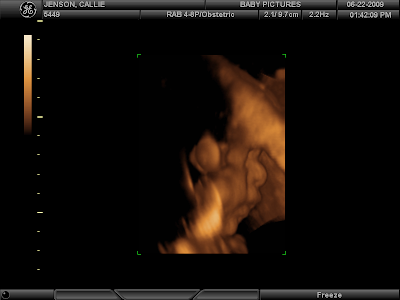 I love the feeling of our baby moving around but it is such a weird feeling as well. Weird that there is something else growing in me. Anyway, that's about it for this week. Here is a belly pic from a few days ago. After such a busy weekend, Monday comes much too quickly and I almost forgot Not me! Monday. But alas, here it is. I did not start crying (only just a little) the other day when it felt like I was being stabbed in the side as my ligaments are being stretched by our growing baby. No way, I don't cry over things like that. And wow am I going to be in for it with labor. Yikes! I did not spend every evening last week and likely this week at my husbands 2nd office as he is working long hours between his two jobs. We did not eat out almost everyone of those evenings either. Not me! I plan ahead and have dinner ready to bring to him. And I am not so excited that I am taking vacation time from work next week, even though I don't have anything planned and will probably get bored. Another Monday down. Feel free to join in. You can check out MckMama's blog for all the details and to see what she and everyone else has not been doing this week. Just an update from my doctors appt. The nurse called with the results from the glucose test and I don't have gestational diabetes. Actually my blood sugar was too low at 56, so I was told to eat more often, which I don't think I'll have a problem doing. And I am not anemic, so that's good new too. Thanks everyone for your prayers. I finally finished painting the baby's room. If I do say so myself I think it turned out excellent! 1. Take down wall paper trim, tape the middle line and prime the upper half. 2. Paint the upper half green. 3. Re-tape the middle line on the green half. 4. Paint the bottom half brown. 7. Paint the circles in contrasting colors. Decide the first circle is to fat, decide to paint circles thinner. What do you think? I love it. I am so happy with the way it turned out. I can't wait for all the furniture, baby stuff, and of course the baby! 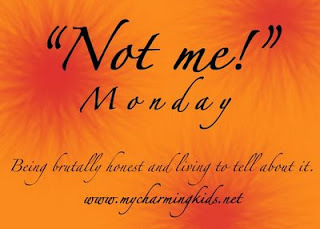 It's Monday again.....time for Not Me! Monday. Thing I would never ever do and would never ever blog about them even if I did do them. I did not almost crash the car while driving because there was a bug ON me, twice. I certinaly did not scream and let go of the wheel. And my darling husband did not just laugh at me in the midst of the bug being ON me. No way. I don't scream when a bug or spider is ON me or even near me. Not me! I did not make my husband take a bubble bath to help his very sore back. I did not put too much bubbles in the tub expecially after the jets came on and I did not take this picture of my hubby in the tub. And with the hot weather and working outside in the yard, I have not totally let the house go to put and with all good intentions just have not been able to muster up the motivation to get it back into order. Not me, I always keep a clean house. Oh and I did not start crying yesterday when I was trying to get the video of the deer, downloaded from the video camera onto my computer and I couldn't figure out how to do it and it was way more complicated than I thought. Not Me! I am not that emotional. I never cry for no reason. This is hilarious comedy skit. You gotta watch it. My new stroller. 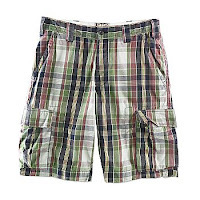 A Phil & Ted's sport. I love it. I got it on craigslist for about 1/2 the price that they retail and it is nearly in brand new condition. It even comes with a double seat, a rain cover and a pouch for keys/wallet/phone and 2 cup holders. I can't wait for walks and jogs at Marymoor Park. This weekend (well Friday and Saturday), Devin and I (mostly Devin) spent the days demo-ing the back yard some more. We took down (destroyed) the potting shed, cut down 3 trees and then burned all the evidence (except for keeping firewood). Here are some pics. Can't you just see the beautiful lawn we are going to have! Devin driving one of the two piles of branches down the road to the burn pile. We started out with a burn pile of our own in the back yard, but then the fire department came and we quickly put it out while they drove down the road and saw the neighbors burn pile and kept on going. We didn't want to chance it after that. We took it down the hill and burned it all up in a few hours along with the rest of the potting shed. Our backyard is going to look so good!